Excerpted with permission of the publisher, Wiley, from “Account-Based Marketing” by Chris Golec, Peter Isaacson, and Jessica Fewless. Copyright (c) 2019 by Chris Golec, Peter Isaacson, and Jessica Fewless. All rights reserved. This book is available wherever books and ebooks are sold. There is not one perfect sequence of activities to follow because it will depend on the backgrounds and personalities of the people you’ll be approaching in addition to the culture of your company. However, in general, here are the steps to follow. Know what the goal is and is not. You are not asking people to “adopt ABM,” or “switch to ABM,” or “agree that ABM is a better way”—at this stage, all you’re going to be asking for is for them to agree to an itty bitty pilot. It should be big enough that you’ll get meaningful data from it, but small enough that it doesn’t look scary. Just a pilot. Be a tester, not a cheerleader. Sometimes the more enthusiastic someone is about a topic the more negative others feel like they need to be. They see you hauling on the tug-of-war rope and find themselves wanting to pull in the other direction. If you are talking with people who have their reservations, then meet them where they are. Agree that we “don’t know how this ABM thing will work” in our organization. You might even say that you have some questions or reservations of your own—and that’s the very reason why the pilot will settle the matter. Identify champions in Sales, Marketing, and Operations. Sure, the ideal situation is an entire unit will be on board with doing an ABM pilot, but that’s rare. It’s better to assume that you’ll need to grow that enthusiasm, by first finding even just one person in each of those areas. In addition to someone from Marketing and someone from Sales, you need a Marketing Ops person. He or she will be crucial to building your list, and reporting on progress against goals. The Marketing Ops person often will evaluate, purchase, and implement ABM technologies, once you’re out of the pilot. He or she will also connect the business goals to execution. It will involve measuring progress using multiple tools, including web, marketing automation, and your CRM. Having the Marketing Ops person on board from the outset will create a level of ABM familiarity that can accelerate the eventual rollout. Identify a few other people with key roles. You’ll need a Target Account List Owner who is the expert on your list. This person knows how the list is put together, who the internal contributors are, and can track performance against the list. You’ll also need an executive sponsor. This crucial person will help guide the necessary alignment between teams, ensuring collaboration and compliance. The sponsor can also help reset expectations. After many years of following the high volume/low quality lead approach, it’s a mindset shift to accept lower lead volumes, new roles that come up, and possibly redefined territories on the sales side as a result of this new focus. Talk with people individually at first. Gather information about where each person’s head is in terms of prior experience with ABM, objections, current pain points, and so forth. You’ll get better information one-on-one than you will in a group setting, where some of the people you need to hear from may clam up for whatever reason. Bring out the pain. We know that sounds bad, but then again, we’re persuasion professionals. A tested and proven sales principle is “problem agitate solve” and that works on us, too. By getting people to talk about the current difficulties among Marketing and Sales especially, it has the effect of making people understand that you know what they’re going through, and that honesty is okay. It builds rapport and further justifies why folks should give ABM a try. Describe key benefits by department. If you’re talking with a marketing person, explain how the ABM pilot has the potential to bring added focus and efficiency. It will also help Marketing be more connected, not to leads, but to revenue. If the person is from Sales, then discuss how ABM should result in greater precision, coordination, and velocity in target accounts, with focused support from Marketing. Explain how he or she won’t have to waste time following up on leads that don’t matter. To someone in Operations, the benefit is at last a coordinated platform and language between Sales and Marketing. Sooner or later, Finance will get involved. To those people, explain the great news that ABM can bring greater predictability, transparency, and visibility into marketing expense ROI. Because ABM is an efficient strategy, you can actually engage more of your target accounts on the same budget. That may be true, but let’s see first if they’ll agree for the sake of the pilot, instead of assuming that they won’t. Besides, we might be able to find a sales rep or industry team that’s willing to work with us on this. What we understand from the experience of others who have implemented ABM is that a properly executed ABM strategy will actually deliver more qualified leads and fewer of the leads that never turn into business. Be careful how you ask for commitment. On the one hand, you do want people to lean into this pilot and give it their best effort. On the other hand, asking for “commitment” is fraught with over- tones in English: committed relationships are forever and you might hear “Hang on—I thought we were talking about a pilot here! We don’t even know if this stuff will work!”Therefore, it may lower the perceived leap to talk about “giving your full support to the pilot.” That has no overtones and points to the same goal. 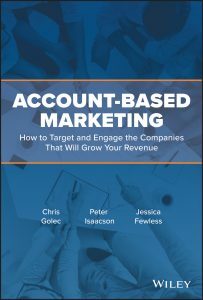 For more information on “Account-Based Marketing” by Chris Golec, Peter Isaacson, and Jessica Fewless, click here.